Mike and Sean Cummings pose with the Torch Award for marketpace ethics. When Michael Cummings finished trade school post-college, he began working for a construction company. An opportunity arose for him to join in ownership of a general-contracting firm. Now, 25 years later, he is the proud owner and CEO of a multi-award winning business, MIKEN Builders. 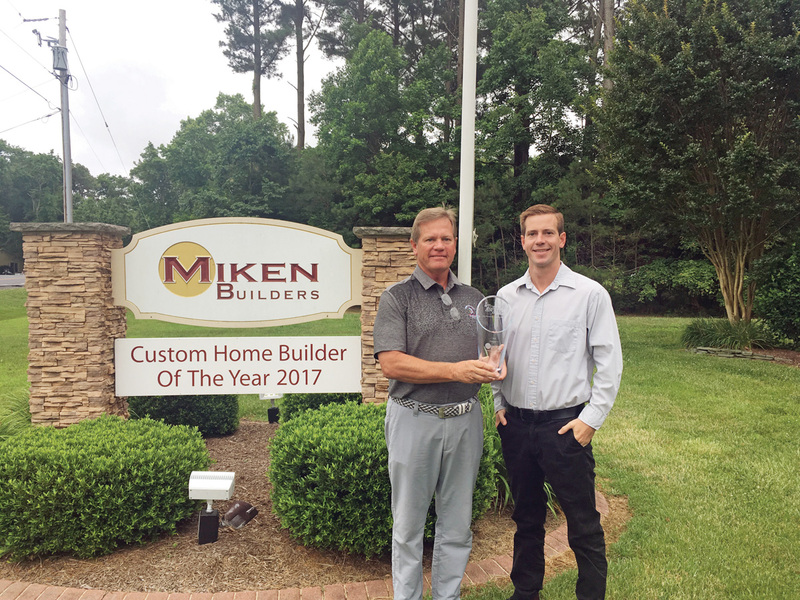 On June 7, at the DuPont Country Club at the Better Business Bureau banquet, MIKEN Builders was honored with its most recent award, the Torch Award for marketplace ethics. On May 18, the National Home Builders of Delaware had awarded MIKEN Builders for Best Luxury Community Home and Best Residential Addition at a ceremony in Bethany Beach. Those awards are added to a long list of recognitions by Houzz and the Home Builders Association, including Best of Houzz 2018 Client Satisfaction award, 2016-2017 Sussex County Custom Home Builder of the Year, 2014 Remodel Excellence for under $50,000, and 2013 Best Condo (Chesapeake Penthouse). MIKEN Builders does custom home building in the Bethany Beach, Ocean View, Fenwick Island and Dewey Beach areas. The company specializes in general-contracting services, construction management and design-build to the residential and commercial industry. The approximately 20-person staff consists of construction industry experts, each with decades of experience. The construction business is also a family affair. Michael Cummings works alongside his son and project manager, Sean. “My dad is a pretty patient guy, so he understands the trials and tribulations I go through on a day-to-day basis,” Sean Cummings said, adding that his father is empathetic when problems arise and makes himself available to help the team find solutions. Michael Cummings, and his team, also employ that problem-solving mentality outside of work, through community outreach programs. MIKEN Builders is located at 32782 Cedar Drive, Unit 1, in Millville. For more information, call (302) 537-4444 or visit mikenbuilders.com.